Were you also looking for Jiralhanae Captain Ultras? The Ultra is a Jiralhanae rank. It is the highest rank attainable by regular Jiralhanae infantry. The Jiralhanae of this rank usually lead a small group of Unggoy, two or three Jiralhanae Minors and sometimes a Major. The Jiralhanae Ultra is the highest of the three Jiralhanae infantry ranks, and as such they are fewer in number than Minors and Majors. Because of their intermediate status on the Jiralhanae hierarchy, these Jiralhanae can usually be found leading at least two Jiralhanae Minors and groups of lesser Unggoy and Kig-Yar. They are also frequently led by a higher-ranking Jiralhanae Captain or Jiralhanae Chieftain. Ultras are issued violet Jiralhanae power armor with upgraded shields. They can be observed wielding a wide variety of weapons. These include Type-25 spikers, Type-25 Brute shots, Type-51 carbines and occasionally, Type-50 particle beam rifles. The Type-51 carbine is especially favored by Ultras. In addition to the large list of weaponry, Ultras also pilot Type-25 Choppers, as seen at the Battle of Earth and Installation 00. Several have also been seen driving Type-52 Prowlers. Jiralhanae Ultras have slightly stronger shields and more health than Jiralhanae Majors and Jiralhanae Bodyguards, although they are still less durable than even the lowest ranking Jiralhanae Captains. Notably, on Legendary difficulty it takes 2 particle beam rifle or SRS99D-S2 AM sniper rifle shots to drop an Ultra's shields, whereas all other Jiralhanae ranks lower than the Jiralhanae Captain have shields that can be destroyed with a single particle beam rifle or sniper rifle shot. 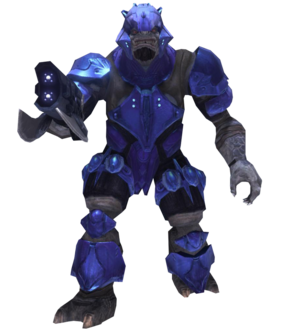 However, the difference between a Jiralhanae Minor and a Jiralhanae Ultra is not as dramatic as the difference between a Sangheili Minor and a Sangheili Ultra: a Jiralhanae Ultra can only withstand a few more shots than a Jiralhanae Minor, whereas a Sangheili Ultra has 3 times the shields and health as a Sangheili Minor. Jiralhanae Ultras are the most experienced of the three Jiralhanae infantry ranks, making them much more challenging opponents than the Minors and Majors. When facing an Ultra in battle, you should first pay attention to the weapon he wields and adjust your strategy accordingly. For example, if he has a Type-52 Mauler, keep your distance from him, as his weapon will be less effective at long range. Try to eliminate this threat first unless a higher ranking Jiralhanae is on the field. When wielding Brute shots, take cover as much as possible, as he will continuously fire at you. When you come to close quarters combat, he'll try to punch you. However, if you hit him first, he'll be stunned and left vulnerable to further melee attacks. A Jiralhanae Ultra on the Ark.